When Parrot contacted me to see if I might be interested in their new Parrot AR Drone fully autonomous quadricopter, I jumped at the opportunity. It was great timing since I was just in the middle of writing a page on quad rotor RC helicopters ,qudrocopters, or multi-rotor as they are often called and of course the AR was the perfect quad rotor to start with way back then. Pictured here are all the bits that come standard with the AR Drone right out of the box! The latest 2.0 version (second generation) is also available now with pretty much the same components in an angular body and much better HD camera. The Easiest Flying Experience Ever! What I wasn’t prepared for was just how easy the Parrot AR drone was to get airborne and is by far the easiest to fly RC aircraft I have ever flown. I knew these fully autonomous quad copters basically flew themselves with the sophisticated electronics doing all the hard stabilization work; but to be honest, I didn’t think something this inexpensive ($250.00 USD) would be able to accurately hold its position for any length of time. With most other fully autonomous quadrocopters easily costing well over $600.00 (at least back then), I didn’t hold my expectations too high in other words. Well, all I can say is this truly is a very sophisticated autonomous flying robot. This was the first RC aircraft I have ever been able to do an entire photo shoot by myself with the heli hovering perfectly stationary while I took the photos. The AR Drone will stay perfectly stationary for an entire battery pack if you want it too. Just hit the auto take off button and set the altitude you want it to hover at and the four propped birdie will do the rest. 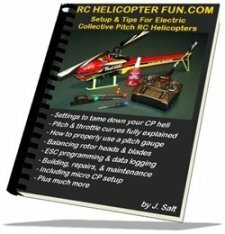 10 minutes of complete hands off hovering – tell that to any RC heli pilot and they will look at you as if you came from another planet! Once you start controlling the Parrot AR Drone and flying it around, it will never fly past the various pre-programmed flight parameters that you can also alter if you want to sport things up a bit or even tame them down further. Essentially, the only way to crash the AR Drone it is to fly it into something. The Parrot AR Drone will stop and settle back into a perfectly stable and stationary hover the instant you are feeling uncomfortable and let the autopilot system take over. The newer 2.0 version is even capable of basic aerobatics at the touch of button. Parrot's YouTube channel has a nice video training section as well that walks you through a decent video flight lesson plan. Not that most people will need it since these things are so easy to master, but the training videos are worthwhile to watch and show you exactly what your Parrot AR Drone can and can’t do. Here’s an example of one of the lessons below. The overall build quality and strength of the Parrot AR Drone and second generation 2.0 version is very good. The four propellers are made from very flexible plastic so they can take a lot of punishment before breaking. The carbon fiber cross frame that the four motor nacelles mount to is very stiff & strong, and the polypropylene foam body and covers keep the electronics and battery well protected. The weakest components on these AR quad rotor helis are the four exposed plastic reduction gears on each motor nacelle and the four propeller shafts which I did bend a few times with some pretty respectable crashes into harder objects and managed to crack one gear so far. I'm also very surprised that Parrot is not using ball raced bearings for the propeller shafts instead of brass bushings, for both the first and second generation 2.0. The eight bearing upgrade kit is one of the first items I would highly recommend installing in any AR Drone to reduce drag and eliminate the bushing/shaft slop that slowly develops as both the bushings and shafts wear. I have listed several bearing upgrade kits on the right with all the other AR Drone parts and accessories. Below is a video showing how simple it is to upgrade to the bearings. The next video shows just how easy the AR Drone is to work on and repair. In addition to the bearing upgrade kit; an extra blade set, gear set, and the AR Drone tool are what spare parts I would recommend getting when you purchase your AR Drone so you have them on hand. The Parrot AR Drone’s brushless motor circuitry is bullet proof when it comes to detecting any sort of excessive drag on the propellers. The instant you fly into something or even land in tall grass, as soon as the propeller/s encounter any resistance, the power is shut down immediately. This is not only a safety feature; it goes a long way to protect the AR Drone from damage during a crash and keeps the motors and ESC circuitry from burning out as well. How Does The Parrot AR Drone & Drone 2.0 Work? If you have read my Quadorocopter Page , you have a basic understanding of how all quad rotor RC helicopters work, so I won’t get into that. What I want to briefly explain here is how the auto pilot system on the Parrot AR Drone functioned and the limitations. There are essentially 3 sensory input’s that the autopilot in the Parrot AR Drone detects and corrects for. First off is a 3 axis gyro/accelerometer. This allows the AR Drone’s auto pilot to detect any pitch, roll, or yaw movement and correct as needed to keep the heli stabilized. 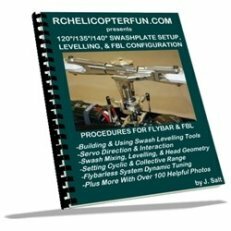 This is very similar to the electronic flybarless stabilization systems all us RC heli people are familiar with. Next up is an ultrasonic sensor system pointing down at the ground to accurately establish altitude position. This ultrasonic system is very accurate up to about 3 meters (10 feet) or so. After that it doesn’t work that well but you can turn that portion of the autopilot off allowing you to fly as high as you wish. With the Parrot AR Drone in that altitude range above the ground, the auto pilot will hold a fixed altitude very well. The 3rd autopilot sensory input is from a small digital camera that is pointed down at the ground. This camera will detect any X/Y axis ground movement and together with the gyro/accelerometers on board is able to hold a deadly accurate position over a fixed point. As the altitude increase, of course the less accurate this becomes, but up to 20 feet or so it seems to be not too bad. What I was impressed with on this camera positioning system is just how well it worked. I thought over a surface with no contrasting and different patterns to pick up on such as polished concrete, carpet, or grass that all look the same, there would be some positioning issues but that didn’t seem to be the case. I did notice however the Parrot AR Drone would drift ever so slightly over no contrast surfaces like these and would tend to yaw off heading several degrees over a 10 minute flight. If I drew a cross or X pattern on the floor, the AR Drone would lock on for an entire battery pack with no movement what so ever. The only other limitation with this camera positioning is there has to be enough light for the camera to see any ground movement. If for example you turn the lights off or fly outside at night, the camera can’t pick up any ground details and the drone will drift all over the place meaning you will have to constantly give corrections just like a standard easy to fly coaxial RC helicopter. Light levels can be quite low however and if there is enough light to read by, the AR Drone’s auto pilot can see the ground in enough detail to hold a locked position. Altitude positioning will not be effected however since the ultrasonic sensors can "see" in the dark. With software upgrade capabilities, you know there will always be improvements that will be made to keep your AR Drone current and flying better and better with perhaps even more performance or better auto piloting. This feature alone adds tremendous overall value and with a full list of replacement parts, you will always be able to keep your Parrot AR Drone quad rotor flying and performing like new. 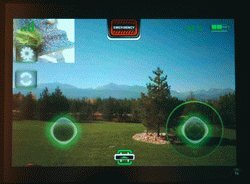 How Do You Control The AR Drone? This is perhaps the most unique aspect about the Parrot AR Drone, and why I feel it and subsequent generations of non-hobby consumer targeted quad rotors are going to be one of the most popular RC aircraft of all time. 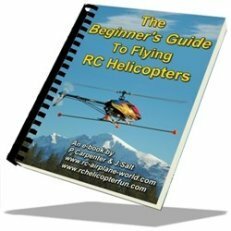 They appeal both people just starting out and looking for an easy to fly RC helicopter platform or for people who have no interest in RC flight at all and just want to have an enormous amount of fun with a super easy to fly techie gadget or perhaps do some simple aerial photography or video work. You control the Parrot AR with an smart device (phone or tablet) using an iOS or Android AR Drone Flight App. No expensive RC transmitter needed here, just a device that so many folks already have. The accelerometers in these devices act as your pitch and roll control making for such an easy to get use to control interface. It is as easy as downloading the "Free Flight" app and you’re on your way to flying your AR Drone with any of these smart devices. The AR Drone sends out its own two way WiFi RF signal. This is so simple to setup... You just power up the AR Drone by connecting the LiPo pack, and then go into your device's setting menu and select the AR Drone’s WiFi signal. As you can see below, I have been using my iPad to fly the AR drone, and it works so well. There are various parameters as I mentioned that can be altered to allow for more or less aggressive style flying or to customize the i-device to suit how sensitive or docile you want the control to be, much the same way us RC’ers use dual and exponential rate programming on our computerized RC transmitters to alter the feel of the aircraft. Ah yes, the other big advantage of using a WiFi signal along with a smart device to control your AR drone is to have real time streaming video and telemetry coming back from the aircraft so you can see what it sees and monitor the battery condition and WiFi signal strength. First person view is one of the fastest growing segments of RC right now due to advancements in camera miniaturization and video signal transmission technology. The problem however is the video image is not the best, at least when viewed on the larger iPad screen in 2X (it looks pretty good at 1X or on the iPhone or iPad). That said, viewing and flying with the tablet is enjoyable. The image refresh rate can also be very slow depending on image complexity & connection speed – at least that was my experience with it. Sometimes the images coming from the forward facing camera were only refreshing every second or so - way too slow to allow for accurate flying by watching the screen alone as if you were sitting inside the bird. The claimed refresh speed for the forward facing camera is 15 frames per second, but I think the conditions have to be absolutely ideal for that kind of performance. The new AR Drone 2.0 however has a much improved camera and refresh speed so these issues have more or less been ironed out. As a RC helicopter pilot I still can't get over how well the autopilot system works, but for those of you who think you will be flying your AR Drone as if you are sitting inside it with streaming FPV images – I thought I should at least point out it isn’t that easy when the images are being refreshed so slowly. As I mentioned before, there is also a video camera pointed directly down at the ground that the autopilot system uses, but you can also watch the streaming video from that camera and the refresh rate is much better (claimed to be 60 fps). For the autopilot to work correctly, it needs a fast image refresh rate so it makes sense that camera is faster. You can select between both camera views (front or down) or you can have both views on the screen at the same time. The main view you select will take up the full screen and the secondary view will show in the top left hand corner. No Recording or Still Image Capture Capability? Nope, and for me that is a much bigger issue than getting a fast FPV experience. Most of the people I know who mount small video cameras on their RC aircraft do so to record aerial video and take still aerial photographs. Obviously Parrot didn’t see this as something that the average AR Drone customer would want putting the focus more on the "augmented reality" side of it, but I know some people (myself included) would like to record images, even if it cost more. I admit the image quality is not great and that is why I suspect recordable imaging was not given a priority. Perhaps the next generation of the Parrot AR Drone will have this capability with a better camera or an app will become available to make recording possible as a video download to your i-device? The latest firmware for both the original Drone and standard on the new 2.0 version do support both video recording and still image capture so thanks Parrot for listen to us - my Parrot AR Drone is now even better than before. The image quality is still not stellar by any stretch on the first version, so if you are after good image quality and a better FPV experience, definitely shell out the extra $50 bucks for the second generation Parrot AR Drone2.0! I have been getting a kick out of some posts on various tech forums that state how lousy the flight times are. The fact is the AR Drone, considering its weight and the size of LiPo pack that it uses (3S 1000 mAh pack), is right in line with most other electric RC helicopters - hell, even my nitro and turbine powered RC helicopters only get 10 minute flights on a tank of fuel - a 10 minute flight is therefore very normal in the RC world. Seen here next to the AR Drone is an electric powered 300 size RC helicopter that is pretty much the same size & weight and uses the exact same spec LiPo pack as the AR Drone. This particular 300 heli (Blade SR to be exact) will fly for about 10-12 minutes on a fully charged 3S 1000 mAh pack and it’s not powering any sophisticated auto pilot system, video cameras, or using power to transmit video and telemetry back to the pilot. It really is amazing when you think of the processing power that is being consumed along with power for video and telemetry transmission on top of the power being consumed by four brushless motors that Parrot's Drone can fly for over 10 minutes with a small 1000 mAh LiPo pack at all. Parrot’s web site says the Drone will fly up to 15 minutes on a charge but I was never able to get that unless I only hovered in ground effect when the lift becomes more efficient. 12 minutes was pretty normal but I feel that’s really hard on the LiPo pack and will definitely reduce its lifespan. If you have read my LiPo battery page , you know one of the most damaging things you can do to a LiPo cell is to draw it down near to, or worse, lower than 3 volts per cell under load. If you fly your Parrot AR Drone to the point the "Emergency Low Battery" warning starts flashing on the Display, the cells are actually being pushed under 3 volts per cell. For the best LiPo battery life, most LiPo experts recommend never drawing a pack down past 80% of its capacity. I have found with the 3S 1000 mAh pack that comes with the AR Drone with normal flying and hovering, that equates to about a maximum 10 minute flight. The battery telemetry on the display is fairly accurate so if you just stop flying when it's at 20% remaining, I have found that to work pretty well. Since I already have many 3S 1000 and 1300 mAh LiPo’s from various other RC Aircraft and I parallel charge them very quickly with a computerized LiPo battery charger, I am able to fly the AR Drone pretty much continuously, only stopping every 10 minutes or so to swap LiPo packs. Like many manufacturers, Parrot says to only use the Parrot AR Drone's LiPo, but it is heavy with the plastic case and honestly not the best LiPo out there with only a 10C discharge rating (sufficient for the AR Drone, but the pack does get pretty warm showing a 20 to 30 milliohm internal resistance on each cell). Even after 2 hours of back to back flying, the AR Drone’s brushless motors only get a little warm – again, showing how efficient brushless motors are. The AR Drone comes with a nice 3 cell LiPo balancing charger that works very well and for most "non" RC people, that along with two or three extra AR Drone specific batteries will be very sufficient, but for those of you with a good computerized LiPo charger and know a bit about good LiPo packs you can certainly use other brands that are both better in performance and much less expensive. These LiPo packs use JST XH balance plugs so they can be charged using the stock AR drone charger. If you do get aftermarket LiPo batteries for your AR Drone, you will have to convert the plug on the drone to a standard spec RC plug and solder it on. The range you can fly your AR Drone is very dependent on the conditions. I have found inside the house even from the second floor to the basement, the signal strength is very strong. Outdoors, as long as there is a clear line of sight to the AR Drone I can control it at least 400 feet at which point it gets too small to see what is going on an disorientation sets in. 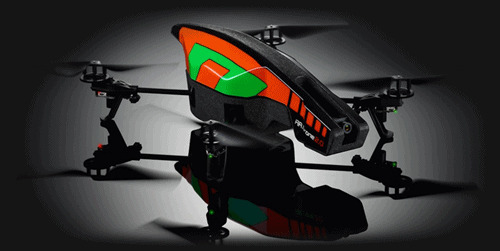 The Parrot AR Drone as you can guess can be flown both inside and out. It comes with two different shells for each type of environment with the indoor shell encompassing the propellers to protect walls and furniture allowing the AR Drone to just "bounce" of them. It is a fairly big indoor flying heli however and with the ultrasonic sensors, can actually be a challenge indoors in a room with lots of furniture that will play havoc with the autopilots altitude control. The AR Drone also is pushing a fair amount of air with those 4 propellers so if you have any loose papers lying around be prepared for some exercise. The outdoor shell just covers the main body section and is lighter than the full protective indoor shell giving very slightly longer flight times. You do have to be careful with this shell in place however since the four propellers are now exposed and as I mentioned, crashing can sometimes lead to a broken part or two. In the setup menu, you can select between outdoor and indoor flight and outdoor and indoor shells. I honestly have no idea what changes occur in the flight algorithms when these different modes are selected but there is no doubt the response and performance is better with the lighter weight outdoor shell on. I really enjoyed flying the Parrot AR Drone outside (as I said, it can even handle some light wind), and I suspect that’s what environment most people will be flying their AR Drones in. Larger uncluttered indoor spaces such as gymnasiums, garages, warehouses, lobbies, and boardrooms to name a few also come to mind as perfect indoor AR Drone flying areas. If you are in the market for a super easy to fly RC helicopter, an inexpensive fully autonomous quadrocopter, or just want one of the coolest techie flying gadgets around, I can’t think of a better product. The Parrot AR Drone and second generation 2.0 Drone will also introduce people to FPV flying and the possibilities of aerial photography and video. Sure, there are some things I felt could be improved on (over and above calling it a drone) such as ball raced prop shafts, better image quality, better refresh rates, recordable video (most of which has been addressed with the new firmware versions and the second generation Drone), and a better battery management algorithm to put the emphasis on longer battery life over longer flight times but those are pretty minor issues considering (as I just mentioned and predicted when I first wrote this) software updates and perhaps an app could deal with several of them. When all is said and done, the Parrot AR drone is a flying robot with a sophisticated autopilot/stabilization system that is easy to fly from your iPhone, iPod Touch, iPad, or Android based tablet/smart phone. It is brilliant fun at a price, which up to this point, for all the technology crammed into this nice little autonomous quadrocoper was unheard of. As you can obviously tell, I am impressed with the Parrot AR Drone and although it certainly doesn’t offer the same heart pounding performance of a big single rotor collective pitch RC helicopter, or a 3D quadrotor, it will appeal to many more people who just want a fun, stress free, fairly inexpensive RC flying experience right out of the box with the uniqueness offered in a quad rotor platform!